Canadian designer, Chet Domanski, has created these great one-off Energy Bracelets. They are made out of 'up-cycled' pieces of the Alberta natural gas line. 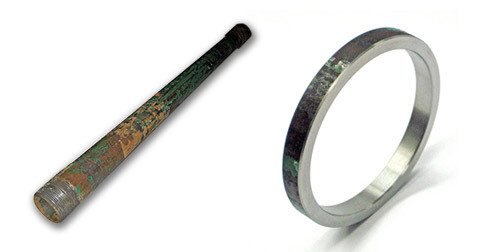 Decommissioned pieces of the pipelines have been machined and chamfered into beautiful bracelets. Each bracelet is tagged with the geographical coordinates of the location from which the pipe was taken. (Found through Sub-Studio Design Blog).